SYNOPSIS: When you can’t beat the odds, change the game. I haven’t loved a set of characters this much in a long, long time; I thought I could pick clear favorites, but by the end of it all, I just cherished each and every one of these little heist-runners so much that the lines in my favoritism were beginning to blur. I laughed, I cried, I gasped, I cringed, and most of all, I mourned the end of their story, because there are books that take you in for a few hours, a few days, a few weeks, and then there are books that you know you will always carry in your heart, and this duology is most assuredly the latter. Nina and Matthias were a couple that took a little warming up to for me, with Matthias’ past, but he progresses so tremendously throughout the duology. In the first book, we saw him start to overcome the brainwashing and blind prejudices of his upbringing, and in this one, that furthers still as he realizes that the Grisha are not demons, but miracles. While Nina is fairly “what you see is what you get”, and we don’t see as much development from her, I still loved her character tremendously and am so beyond ecstatic that we’ll be spending more time with her in the King of Scars serious beginning in 2019. I would also like to go on the record that, of all of the characters that Leigh has written, Matthias probably has my favorite romantic lines, and he made me cry a million times. Wylan and Jesper were still, to be honest, probably my third favorite couple by the end (I refuse to say “least favorite” because that implies that I didn’t love them almost as much as I loved the others! ), but their flirty banter towards the end was absolutely adorable. Jesper progresses so much as a person while he faces his gambling addiction and reunites with his father, and we learn so much about Wylan that is utterly heartbreaking and just makes me want to protect him at all costs. They’re so lovable together, and frankly, much like Kaz and Inej, if I don’t get at least a few brief cameos or references to them in King of Scars, I’m going to riot/cry/set things on fire. Altogether, this was an absolutely wondrous conclusion to one of the singular best series I have ever read in my life. 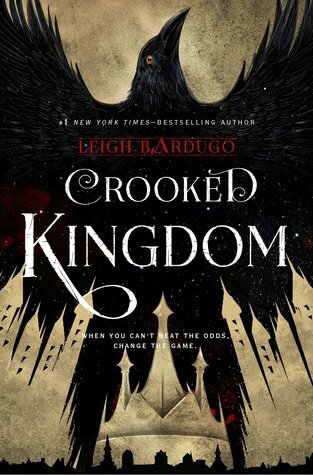 Leigh Bardugo has a way of crafting these worlds and characters that you can’t help but connect with on a practically cellular level, and saying goodbye to their adventures together was more bitter than sweet, as I genuinely never wanted this book to end. I can only hope that the next series will at least bring us some small comforts that they are as happy and healthy as can be expected, and I positively cannot wait to see what Leigh has in store for us all next in the world of the Grisha. Loved Six of Crows and have this one on the shelf. I need to read it soon!! I hope you love it! It was soooo good! Great review. I agree this book is definitely 5 stars. Hahaha yessss! This series immediately went on my faves shelf! Lovely review Destiny! Wylan and Jesper are my favorite couples because they are so cute! But then, Kaz and Inej’s actions are just AMAZING and Nina and Matthias do have the best romantic lines ❤ I am so torn! Thank you, Tasya ♥♥ They’re all so precious! I love them all so much, truly. Wylan and Jesper are my HEART and I love them so much omg. I mean obviously all the other ships are good too, but they’re definitely my otp forever and ever ahhhh. Bahaha they’re so cute. I honestly don’t think I 100% “got it” until towards the end, but their flirting won me over so much.